On 19th March, New Delhi: MG Motor India reveals their planning to step in the Indian automobile market. It seems that UK based company is all set to setup their business plant in India soon, while working on the Halol plant – which includes the construction of a new press shop and the modification of assembly lines and other facilities. They started doing communication with the suppliers to achieve level of localisation. Instead of all this, a information gathered is MG Motor’s India has all started delighting dealer for their Dealer Road Shows scheduled to be conducted in Mumbai on 28th March, 6th April in Delhi, and in Bengaluru on 16th April. 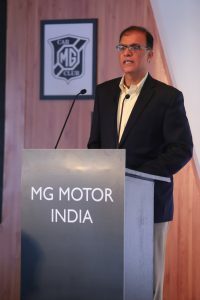 MG Motor India is looking to build a future-ready organization that sets the industry benchmarks not only in terms of a young & smart work culture, but also in terms of diversity; female employees already account for 22 percent of the company’s total workforce. “We aim to increase the number of female hires in the near future. This will make a difference and put them in the driver’s seat in the company, thus breaking the monotony in this industry,” Chaba said. We can wait for the company come and set their trademark in the indian market, While guessing we can say that MG Motors India will come with each segment to give a rivalry either a SUV, Hatchback, Sedan. Hopefully, the company will get the operations in gear by later 2019.